What the Heck is an Accent Wall? First impressions are key to selling a home. When a potential buy walks into your home, you want them to be in awe, you want them to see themselves living in the house, but most importantly, you want them to keep thinking about your home when they return to theirs. To gain a buyer’s attention, it’s best to give them something upon which they can cast their focus… That is what the heck an accent wall is. An accent wall is a feature piece that is built into the structure of the home, it provides a contrast to the rest of the walls in a house, but shouldn’t be unnerving. You can’t just paint a wall bright orange and call it an accent wall… Well, you can, but in most cases you shouldn’t expect it to have a positive impact. An accent wall does not have to be loud, it should deliver distinct energy that is different than the other walls, but balance the room as a whole by tying into other design features. Take the image to the left for example; the white walls with large windows provides a bright airy atmosphere that allows for the floor and counter top to be a dark wood without making the whole room look like a dungeon. The contrast works well on its own, however the accent wall acts as a linchpin by providing a contrast at eye-level that pulls attention away from the starkness of the light wall/dark floor contrast and introduces a blending point. 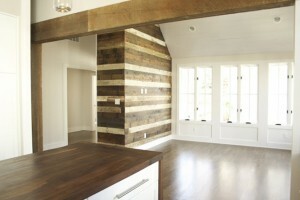 Accent walls work very well in contemporary homes. However, it is important that the wall not be a standalone feature. Its color must be replicated by the room’s décor. As you can see in the photographs to the right and below, there is subtle repetition. 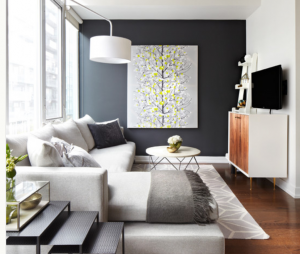 The disparity between charcoal accent wall and much of the white design is softened by the black TV, gray pillow, wool blanket, and slate desk. Even the orange accent wall below can fit look appropriate when you carefully add some tangerine pillows and soft lights. At Staging Denver, we have the eye to recognize the potential of rooms like these and really bring them to life. It doesn’t matter if you need your house to look at its best to sell for top dollar or you are looking to revitalize your current home, our experienced professional stagers know how to bring your any space to life. We are proud to say that we have earned our clients thousands of dollars over the asking price of their homes after stag ing their home for their first open house. Contact us to discuss your goals and set up a consultation and let’s make your home beautiful again! To subscribe to our newsletter, simply enter your email below. A confirmation email will be sent to you! Copyright © Staging Denver. All Rights Reserved.